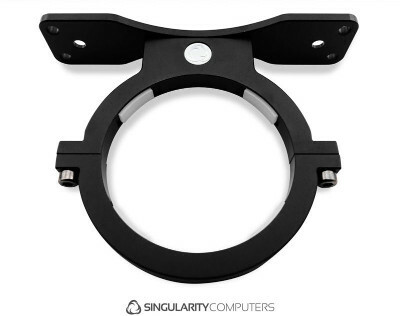 Full disclosure: I support Singularity Computers through their Patreon. I purchased this initially for a large distributed computing build. But since that project is going in a different direction, I thought it’d be best instead to use this mount here in the radiator box. It’ll be a hell of a lot more stable than trying to use the standard EK reservoir mount with UN Z2 brackets. And it’ll look better as well. Plus the silicon inserts will help prevent some vibration transfer to the chassis. And the use of additional silicon washers between the mount and radiators should damp it further. In the previous iteration I mentioned vibration transfer from the pump to the reservoir. I swapped the Koolance D5 Strong (PMP-450S) for the Koolance D5 Vario (PMP-450) in the same housing. Virtually everything else remained the same in the radiator box. For now at least. I was only concerned at this point with getting the pump swapped. I made the reservoir mount swap simply because I needed to disassemble the setup when another EK fitting decided to leak. More on that later. I set the pump at level 3 running at 12V and turned the fans up to 7.5V. And it runs very quiet, virtually inaudible sitting not even a yard from it. As expected there was vibration transfer from the pump to the bottom panel, but it is significantly reduced from the D5 Strong and didn’t radiate out to the edges of the panel and to the sides of the box. Overall definitely a win. Ambient temperature was 76°F (24.4°C). Coolant was distilled water with a few drops of copper sulfate. For the GTX 1070, the power target was maxed out in EVGA Precision XOC but the clocks not modified. I again ran Furmark for 30 minutes. Temperatures touched 38°C, but held steady at 37°C. This is only a touch warmer than with the D5 Strong at 12V. Before swapping the pump, I actually spent a day the previous weekend playing Doom (2016). The graphics card never hit 40°C, and the game was running for, easily, nearly 10 hours straight when accounting for breaks (the pause menu isn’t exactly stressful). So this gives me reason to believe I can do something like that again. For the CPU test, I again ran a Handbrake video conversion that lasted over 20 minutes. The hottest core touched at 45°C, as did the package temperature. Like the previous test, none of the cores held at their max temperature, instead holding around 40°C or 41°C. Occasionally touching a couple degrees higher, but never for long. So the temperatures on the CPU were a few degrees higher than with the D5 Strong. So overall, as expected, the temperatures were a little higher than with the D5 Strong. But the Vario is noticeably quieter than the Strong, especially at level 3, which is about middle on strength with the pump. To overclock the graphics card, I set EVGA’s Precision XOC to a manual voltage/frequency curve and had it auto-detect. This allowed for a boost clock of 2126 MHz, a nice boost over the original boost clock of 1987 MHz (advertised boost clock for this card is 1784 MHz). I added 500MHz to the memory after getting driver crashes at 550MHz. I’m not interested in dialing it in any further. Previous benchmark scores without the overclock are in blue. During benchmark testing, the core temperature never reached 40°C. I’ll look at overclocking the CPU later to see how far I can go and how the temperatures look. Currently it typically sits at a clock speed of 3.6GHz. About the only thing really left to do is change out the tubing and perhaps some better cable management. Along with probably figuring out a way to mount bulkhead fittings in the H440. I’m also not too thrilled with the fitting arrangement between the radiators. In taking the radiator box apart to change out the reservoir mount and pump, another of the EK fittings sprung a leak on the rotary assembly. I had a spare on hand (I bought two the last time this happened in case I needed to replace both at that time) so I didn’t need to make an emergency trip to Micro Center. In swapping out the fittings, I made sure this time to not make the same mistake. I left loose the sealing collar on the SLI fittings until I had the radiator panel installed. This should avoid any potential stress on the rotary fittings that led to two of them leaking. I want a better option. The only better option, though, is a circular tubing bend. The diagram for the radiator puts the fittings at 15mm plus the distance between the fan screws. Which on the panel that distance would be 30mm. So 45mm (~1.75 in) between the fittings on center. I have a tubing bender for copper, but that has a center-line radius of 38mm, meaning a 180 bend center-line bend diameter of ~76mm (3 in). So like a lot of this project, my option appears to be… going custom. And this is in part the fault of the radiators I selected. In doing some math on the AlphaCool ST30 (of which I have two triple-120mm sitting around), the center distance between the fittings would be a hair over 2″. But I have another option that could prove fruitful that I’ll look to later.